Wear your favorite football jersey and join us on Sunday, February 5, 2017 from 9:30 am to Noon for breakfast and fellowship after the morning Masses. Start your day with our delicious pancakes, sausage & gravy, eggs, bacon, warm syrup, orange juice, tea, lemonade, and coffee. We’ll be serving breakfast in the Parish Hall below Saint Bridget’s Church, 202 Ellis St., Glassboro, NJ 08028. Proceeds from the breakfast benefit the charitable works of the Knights of Columbus Assumption Council 3397. Rowan student organizations who attend with five or more members will receive a service letter. Pre-register on the Assumption Council’s Pancake Breakfast page to receive the $5 early bird price! 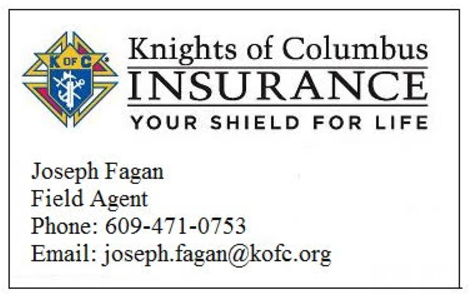 Proceeds from the breakfast benefit the charitable works of the Knights of Columbus Assumption Council 3397! Pre-register via our Assumption Council’s Pancake Breakfast contact form to receive the $6 early bird price! Our Knight servers Mike Walsh, Jim Cosgrove and Clete Beckel were ready to dish out the vittles. The cooks Michael Hensh and Neal Cullen kept the food coming all morning. Two words – tater tots! Cooked up nicely by our Field Agent George Hayes. Our Grand Knight Ray Iacovone kept a watchful eye over the newest addition to our breakfast, the toppings bar. Our worthy chancellor’s newest creation, the chancellor sandwich. Thank you to everyone who came out to our 2nd Annual “Big Game” Breakfast on Sunday, February 1. We were very pleased to see so many Saint Bridget‘s parishioners and guests enjoy the morning of great food and fellowship with us. The Knights of Assumption Council 3397 truly enjoy putting on this breakfast and seeing everyone come together. We are especially appreciative that so many of you continue to support the charitable works of our council, through events like this and our other fundraisers throughout the year. We hope to be able to give back to the parish and the community even more greatly this year. Just steam folks, no fires at our breakfast. There is no hiding from the camera GK. The most important guy at every event, Mr. Clean, Jeff Knowles. Fr. Matthew Weber chats with Bob Irerra. Fr. Robert Sinatra digs into breakfast. Our newest member, Doug Miedel, takes a break to eat with his lovely family. Thank you to everyone who came out and joined us for our October 12 pancake breakfast. We hope you all had a good meal and some great fellowship. See you all at our next event!